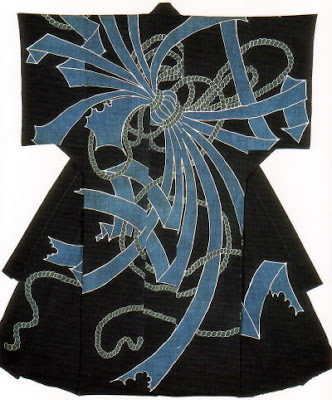 Another of the exciting shows I saw while on my recent trip to NYC was a survey of the textile works of Serizawa Keisuke (1895-1984) at Japan Society, a Japanese designer who took his inspiration from the traditional techniques of stencil dyeing. 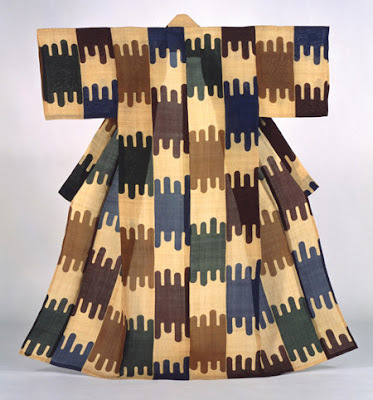 This kimono was stunning in its color harmonies and surprising shapes. There were others just as dramatically beautiful. 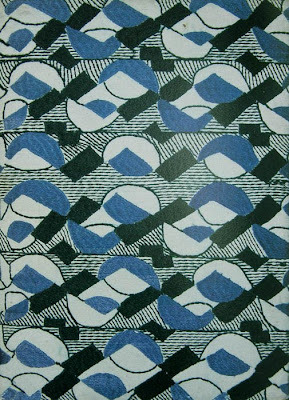 Some of the most startling designs were on Noren, or entrance curtains, their shapes strong and simple. After seeing the show, I became interested in earlier stencil dyeing, and found this example; I can hardly say anything but "wow". 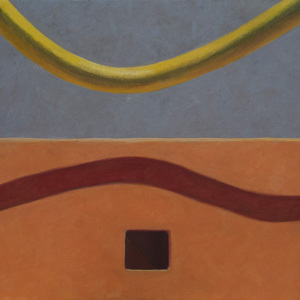 The grand sweep of shapes, flat against ropey forms, create a compelling visual energy. 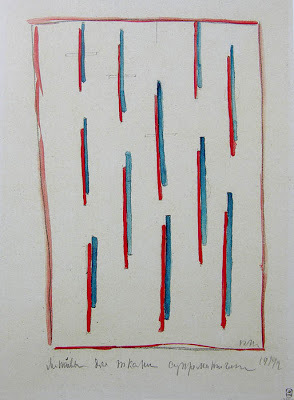 The works by Serizawa using Japanese syllables were balanced in the interesting place between language and design. 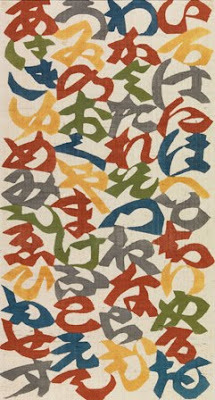 Because we can't read the text, it becomes pure art in the dance of color and shape; but we also know that it is language, even if hidden from us, so carries narrative weight. Spurred on by the show at Japan Society, and by a conversation with Sandy Chilewich at her studio, I began to think about the intersection of fine art and design in the 20th century. 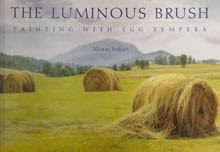 There's a rich history of painters working with textiles; there is also a increasingly non-existent gap between the fine art and design worlds (see the Museum of Arts and Design). In the early 20th century, the utopian ideals of the Russian constructivists, such as Malevich and Popova, led them to design everyday items: fabrics and ceramics and books. Both these artists are primarily known as painters; their works have inspired several of my textile pieces. Liubov Popova, Embroidered Book Cover, ca, 1923-24, silk thread on grosgrain, 18 x 12"
Sonia Delaunay is a painter who worked intensively in the design world, becoming very influential in abstract design. Abstraction has become so embedded in the way we see the world, in our sense of pattern and decoration, that we forget how very recent it is. 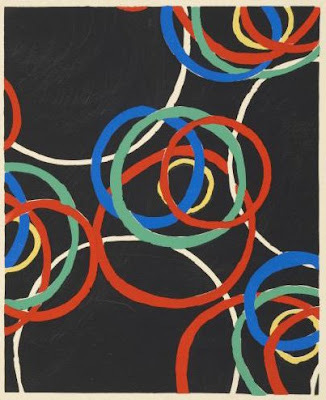 Delaunay brought an inventive and lively sense of color, shape and line to her work. Not only is there a wonderful range of pattern in textile design (a good source of information is The Textile Blog, which covers the history of textiles), there's also been expansion in the idea of what a textile is. I remember seeing a great show of contemporary textiles from Japan at MOMA called "Structure and Surface" (the website is pretty poor, being from 1998). New materials were being used, such as polyester, and steel: quite amazing. A contemporary company, Chilewich, is weaving fabric using vinyl; they also press vinyl into contemporary forms, using a technique that we all remember from plastic doilies. 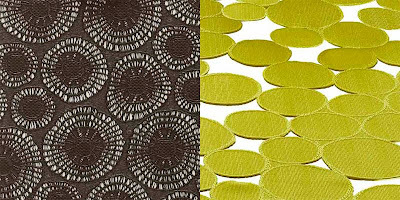 The richly inventive traditions, continuing today, of textile design are inspiring. As a painter, I sometimes feel that my art is too rarified, too much apart from life. My hooked rugs, being one of a kind pieces, are closer to painting than to repeatable design. That there are so many terrific artists, bringing us beautiful things for daily use, makes me happy. UPDATE, November 16: In an email correspondence with a friend, I realized that my link to the Museum of Arts and Design was not truly germane to the discussion. A more appropriate collection to look at is the Architecture and Design department at the Museum of Modern Art in NYC. That kimono comforter from the Edo period is really sweeping. A lovely post overall too. Thank you, Altoon. Lots to think about and look at here. The example above of Japanese calligraphy that's "balanced between language and design" reminds me of Islamic tile work that does the same abstracting with words. This is a bit off-topic, but are you familiar with Persephone Books? I think I have a link on my blog. All of their books (mostly neglected women authors of late 19th and early 20th C.) are covered in a beautiful gray (or grey being a Brit publisher!) paper and the endpapers are all textile designs. Each one is chosen from the era the book was published or has some kind of tie-in with author, subject etc. You can see all the fabrics and read about them on Persephone's site. thanks readers, glad you like the post.